​This water-soluble nutrient is so important that many authorities have suggested that the addition of Vitamin B-12 to many food sources becomes mandatory. 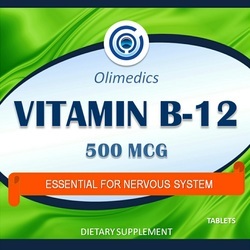 A member of the B-Complex group, Vitamin B-12 is involved in the metabolism of every cell in the human body including normal functioning of the brain and nervous system, DNA synthesis, formation of blood cells, fatty acid synthesis, and energy production. This product is manufactured and packaged in a facility which may also process milk, soy, wheat, egg, peanuts, tree nuts, fish and crustacean shellfish. KEEP OUT OF THE REACH OF CHILDREN. DO NOT USE IF SAFETY SEAL IS DAMAGED OR MISSING. STORE IN A COOL, DRY PLACE. Do not exceed recommended dose. Pregnant or nursing mothers, children under 18, and individuals with a known medical condition should consult a physician before using this or any dietary supplement. Other ingredients: Di-calcium phosphate, microcrystalline cellulose, vegetable stearic acid, croscarmellose sodium and vegetable magnesium stearate.